Scooper - Technology News: Cities are the answer to job creation and poverty reduction. Aren't they? Cities are the answer to job creation and poverty reduction. Aren't they? 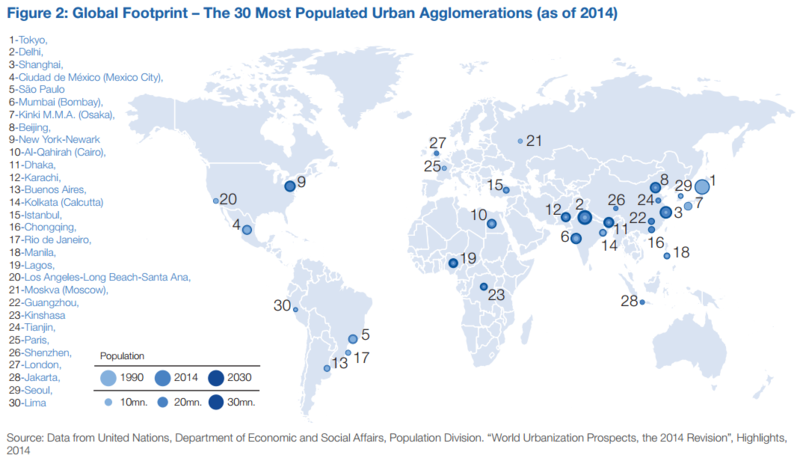 In our rapidly urbanizing world, cities lead economic growth and job creation. They bring people together sprouting innovation. They reduce distance between products and customers. They help put the right people in the right jobs. Yet, they typically also come with congestion and this is why there are increasing efforts to make cities more sustainable. However, just focusing on mega cities and metropoles also ignores that the majority of the urban population still lives in secondary urban centers, or towns. For instance, the share of Dar es Salaam in Tanzania’s urban population has stayed at about 1/3 since 1950 (Figure 1), despite its rapid growth in absolute number of inhabitants. And despite the rapid increase in global urbanization, the majority of the world’s poor still live in rural areas (80 percent in Africa ). These people live at great distance from these mega cities, not only physically, but also sociologically and economically. We believe a focus on employment in secondary towns, rather than just cities, can help create more, better and inclusive jobs. Cross-country evidence suggests that poverty declines faster when people leave agriculture for secondary towns and their rural hinterlands, than when they move to cities. (In the study cities are defined as centers with more than 1 million inhabitants). A recent study from India using satellite observations of night lights to measure the intensity of urban economic activity, which was presented at a joint Cornell University-World Bank conference on “Secondary Towns, Jobs and Poverty Reduction ” points in the same direction. Even more telling is the story of the rural population of Kagera, in Tanzania. They have been tracked over the past two decades (1991-2010), including their migration patterns and the fate of each individual in the original (1991) households. This enabled researchers to examine in detail how many people moved and who fared best. As expected, those who made it to Dar es Salaam, saw their incomes more than triple; they all escaped poverty. Those who remained farmers in the rural areas, also saw their incomes rise, but by only 60 percent. Those who left agriculture for the secondary towns or the rural nonfarm sector experienced a doubling of their income, with the share of people living in poverty declining from 64 percent in 1991-4 to 25 percent in 2010. Yet, when looking at their contribution to overall consumption growth and poverty reduction, it was those who moved to the towns and their hinterlands who contributed most (42 and 50 percent respectively). There were simply many more of them who made it to these urban centers (one in three), while only very few made it to Dar es Salaam (one in seven). Why might secondary town development be more effective at increasing earnings of the poor? At first sight, labor demand forces (and thus job generation) would seem to play against smaller urban centers. If firms benefit strongly from agglomeration and density, then cities should be the champions of economic of growth and employment. Yet, the economic benefits from agglomeration are hard to disentangle from the preferential treatment of capitals and metropoles. Indeed, the economies of scale associated with many of the activities most developing countries focus on, can already be captured at much smaller urban scales. And it is by no means clear that their employment effects in the surrounding hinterlands are greater. Several studies from the US and China by leading scholars such as Mark Partridge and his colleagues are suggesting the opposite. From the workers’ perspective, jobs nearby tend to be more accessible. Links with the farm and the family can be better maintained, which is crucial when land rental markets function poorly or when there are no good fall back options beyond the family and the village in times of need. These jobs are also easier to find and reach given lower transport costs and better social linkages. They are also more likely to match their skills. With most of the poor living in the rural areas, the hinterlands of smaller urban centers, jobs nearby will thus especially benefit the poor. These new insights do not prove that secondary towns are automatically better at generating jobs and increasing earnings for the poor. Yet, they do call attention to the links between the nature of the urbanization process, jobs generation and poverty reduction and call for broadening the urbanization discourse and policy debate beyond the issues relating to large cities. This is bound to be good for jobs, poverty and, given their fast expansion, likely also the sustainability of the cities themselves. The 5th edition of the World Cities Summit taking place in Singapore from 10-14 July would do good to take note.